From a sporting perspective 2014 was mostly a write off for me – in January I got a cold/cough I just couldn’t shake and then ultimately I was diagnosed with Asthma and given 3 different daily medicines. It took me a long while to get back into training and the highlight of the year in terms of triathlon was managing the run leg of a half distance relay in under two hours. Somewhere around July last year with a bun firmly ensconced in Kathryn’s oven I was seduced by the idea of an all new Ironman 70.3 event in the UK. Fast and flat they said and in Staffordshire so not that far at all, I reasoned. Lake swim as well, always important to a swimmer of my calibre (ahem). Baby would be 6 months old by the time the race was due and would of course be unlikely to affect training for a half distance. At least that was my naïve thinking at the time. Credit card at the ready a few weeks later and the race, and 3000 places sold out in 14 minutes. I was one of them. Heady ideas of putting significant time into my Outlaw Half time saw me sign up for coaching about 8 weeks before the baby due date and I started doing some proper training – swimming, running, cycling and even strength and conditioning work. How could I fail! December 17th and suddenly everything went Fresh Prince on me as “my life got flipped-turned upside down” when a little bundle of Alex turned up. My little boy is amazing but he’s really not conducive to great training – hourly feeding, colic and an exhausted pair of parents meant I managed 6 sub one hour training sessions between the birth and April. My coaching was put on hold and then cancelled and the idea of doing the race looked increasingly unlikely. I’d entered a 100km Sportive on April 6th and hadn’t ridden outside for almost six months. A number of turbo sessions the week before, including 90 minutes on Good Friday and then straight into the Easter Monday event. It wasn’t pretty. I vowed half way round that I would have a final can of Coke post ride and then that was me for full-fat pop until after Staffs – at least the ride in the 70.3 was going to be flat (I’ll come back to that). Training didn’t come easily even after that but I did manage a couple of long rides (longest 70km) and a few runs over 10km, (longest 14km). The fact that both those long sessions came on the same day, a fortnight out from the race, was the only thing giving me any real hope. At this point I hadn’t swum since December (and only then up to about 1500m) and hadn’t been in a wetsuit since Summer 2013. In the end I managed one river swim 9 days before the race for all of about 35 minutes. For a 1.9 km an hour swimmer that wasn’t ideal but hey. So in the final days before the race I’m doing my usual prep and checking out the routes – nice easy swim, nice flat bike with only 900m of climb, run…. Hang on a minute – 900m of climb in 90K? The last I looked 100m of climb per 10km isn’t really flat. I can do a “hilly” local ride and not do much more than that. Wimbleball 70.3, notoriously hilly, is only 200m more. My one recent long ride was pancake flat in comparison, under 200m climb in 70km. I’m so under-prepped it’s untrue – I’m just aiming to beat the swim and bike cut-offs now and letting the run take care of itself. We’ve decided that the weekend isn’t going to be baby friendly after all so my father comes up with me and the wife and boy stay home to support from afar. We travel up on Friday afternoon, based on-site at Shugborough, and register and that evening I get my bike and T1 bag all ready. I have to take it 20km away to the start and have it racked at 10am the next morning. The weather is very wet, the forecast for the race isn’t much better so I take the pragmatic decision to leave my normal wheels on and leave the race wheels, which I’ve not ridden since Outlaw 2 years ago, in the bag. We arrive at Chasewater – I can barely see the buoys at the far end which doesn’t ease my nerves. 1.2 miles is really a long old swim for someone who hasn’t done any. Post bike check-in and we drive the bike route – it feels lumpy, barely any flat on it and 3 climbs of real note although none of them particularly long. Lots of standing water too. It takes us 2 hours to drive the course and I’m needing to ride it in under 4. I’m not getting any more confident. Did I mention that I’ve also discovered the run has a big old hill in it which needs going up 3 times. 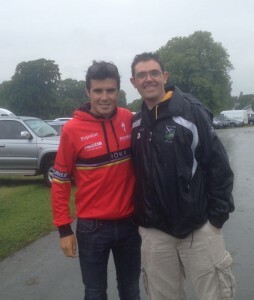 I mill around the campsite and race village a bit and notice I’ve got a little bit of a blister coming but nothing significant and I do bump into race favourite and all round tri legend, Javier Gomez, in the car park. I ask for and receive a photo. I’d seen Gordon Ramsay earlier but didn’t bother asking for one from him. Unusually I sleep a few hours and then race morning and I’m probably not quite as nervous as I usually am. I manage some pre-race oats, an apple bar and a banana. The weather is nice and I don’t even let the fact that I’ve forgotten to put on my number tattoos bother me. In the water 10 minutes later than planned due to a delayed start, I’m off in the second age group wave in a fetching yellow cap. I’d mentally said to myself that I wanted to round the first buoy in 15 minutes and the second and third in 20 minutes. Giving me 5 minutes to get to the exit and plenty of change. So when the first blue-hatted swimmers from the wave behind start catching me well before the first marker I know I’m in trouble. I feel like I’m swimming OK but clearly not. No way I’m going to get round here in an hour. I get to the first marker surrounded by fast moving blue heads and glance at my watch expecting it to confirm my worst fears. Through foggy goggles I can just make out the numbers. 13:58. So I’m ahead of schedule and I work out that they must have started the wave behind off early. I relax into the swim and although I’m being swum over a bit I keep going and round the second marker in 33:58. That’s ideal, bang on the 20 minute target. Third leg goes a little awry as I find it difficult to see the final buoy and I find the majority of swimmers 50m or so to my left around half way down the stretch. I have to make a bit of a detour and notice I’m now 2 minutes down on schedule but nothing to worry about. I kick my legs from here to try to avoid the dizziness and jelly legs I normally get and it seems to do the trick. There’s a decent run from the water to the tent which I negotiate Ok and I’m steady through T1 in ten minutes (including a trip to the portaloo) and out to my bike. Unsurprisingly the area around my bike is deserted so it’s not hard to find my steed. I hit go on the Garmin 800 and am off. Total swim time was 1 hour 1 minute and considering the lack of training only 2 minutes off a PB. I later find out I was 302nd of 303 in my wave in the swim. 304 if you count the guy who didn’t make the cut-off! The start is full of speed bumps and there’s a huge amount of lost bottles littering the road. I keep it in the small ring and just coast out onto the proper roads making sure my legs and head are both in the game. There’s a hill about 5km in that needs some respect so I decide to take it easy until there but when I arrive it’s actually not that bad at all and I pass more bikes than pass me. The roads from there were much easier than in the car the previous day and I make swift progress until I slip my chain. Doesn’t take long to fix but I resolve to keep my bike in the big chain ring if at all possible for the whole ride. Once through the first 15km the roads are really nice to ride on and while my HR monitor tells me I’m riding sensibly enough I’m going faster than I would have expected. I stay out of any packs but large numbers of them come past, sometimes a dozen or more bikes in size. I feed sensibly and often taking plenty of fluids on board and the 30km mark comes up in 1 hour and 10 minutes. The next third of the ride demonstrated that some people went off too quickly as I start to pass riders who passed me early on and while the lead women went passed me like I was stationary I was happy enough with my progress. The roads were undulating but happily the climbs I’d driven up the day before came and went with no real problem – they were more rolling than hilly. 60km done and 2 hours 20 minutes. I’m consistent if nothing else. If the first two thirds were the scenery the last third has the iconic bits of the ride – the drop down to the Litchfield Reservoir before riding across it is impressive as is the views as you swing by the power station. At around 75km or so you enter Cannock Chase and head uphill for the longest climb of the day but it’s nothing too strenuous and it’s here I see the only motorbike referee I saw all day. We were going uphill at the time so he didn’t pay us much attention and by then the likes of Gomez are almost finished so I doubt they were overly concerned about this end of the field. On this section I pass a few people from my wave and a few more on the final run back to Shugborough. 90km comes up in 3 hours 30 so I’ve paced it really well and I think my decent final split throws a few people tracking me who expected the time to drop off like it had with most ahead of me. 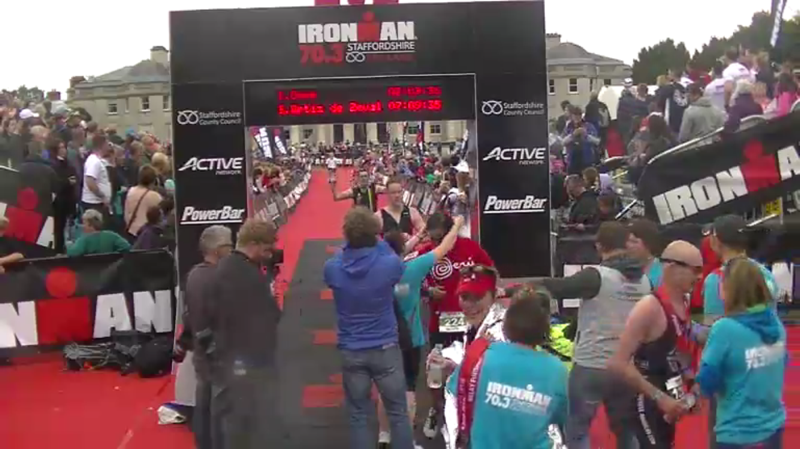 In the end I overtook 7 people from my wave on the bike – not spectacular but ok. The overall clock is reading 4:47 as I put my bike onto the rack and head into the changing tent for the second time. A few more bags around by mine in T2 than T1 shows I’ve picked up some places and I’m quite quick by my standards and off and running in 5 minutes. I’ve promised myself a sip of coke as soon as I hit a feed station and running the numbers through my head I set myself a goal of sub 7 in total. I’ll have to do the run in 2 hours 8 which is faster than I did at Outlaw Half but doable I reckon based on training runs. Hands up if you’ve finished! I resolve to run the whole lap apart from walking the aid stations and this works well as I do the first lap in a solid 40 minutes. The crowds on the course at Shugborough and in the village at Little Haywood are really loud and supportive. Two more laps like the first would do nicely but blisters on my toes are making themselves known and I realise that I’m going to probably have to walk some of the long hill. I end up walking the middle section and also a bit of the second hill as I bump into a fellow NEWT. We both discuss how our sub 7 hopes are probably disappearing but he urges me to push on. Second lap takes 46 minutes and it’s just a case now of running as much as I can manage. The hill on the third time is painful on my blisters and it’s frustrating that it’s those stopping me from running more than fatigue – in hindsight perhaps I should have just run through the pain but I could have done more damage in the vague pursuit of a target that had already passed me by. I continue to the finish and miss the fact that my run time at Outlaw Half has slipped by, enter the finishing chute with a number of others and try to savour the moment. I probably didn’t have any right to finish with the training I’ve done but here I am. Dad sees me cross the line and I’ve since found out that Kathryn and the family were watching the finish line camera as I completed. I managed to overtake another 13 from my wave during the run but if I’m honest I only noticed a few of them. Post race food looks good but I can’t face it as usual, pick up my T-shirt and head outside where I see some of my other club mates finish the race. I have a shower back at the campsite and blisters apart my legs feel fine – I clearly didn’t give all I had and that frustrates me a little. Could I have gone faster on the bike or did I just leave it on the run course? Don’t know – what I do know is I’ve really enjoyed the race – the bike course was excellent, and I’d say ideal for me, not out and out flat, no big hills but a very fair challenge. The run course could have done without the big hill in my opinion and had the rain come down some of the course might have been carnage on some of the sections with 5000 feet running over it multiple times. The split transition isn’t ideal but I can understand why they implemented it. Should give a shout out to the marshalls and volunteers – top notch and the support was also very good. A race I’d probably do again – maybe not next year but in the future. I’ve definitely caught the brand bug though and would love to do a European 70.3 in the future as long as it ticked my boxes (lake swim, wetsuit guaranteed and somewhere where we could have a family holiday around it). Some final stats of all my training since Alex was born in December. 12 runs totalling 9 hours 40 minutes, 107km distance, 612m of climb. Longest 14km in 80 minutes. 4 rides totalling 12 hours 9 minutes, 240km distance, 1766m of climb. Longest 100km in 5 hours. 16 turbo sessions totalling 13 hours 46 minutes. Longest 90 minutes. 1 swim for 35 minutes. Distance unknown as it was in a river. I do not recommend any 70.3 first timers follow the above training plan. It’s clearly not enough really, although if nothing else it shows that I’ve maintained at least a bit of fitness despite very sporadic training and racing in the last 18 months.